Chemical Constituents and Components : Main chemical components are curcumin 95%. Curcumin 95%: 1. It inhibites the lipoxygenase and cycloxygenase properties of human platelets. 2. It inhibits growth of Heliobacter pyloris cag A+ strains (Group 1 carcinogen and is associate with gastric and colon cancer). 3. It increases the mucus content in gastric juices and prevents histamine induced gastric ulceration. 4. It prevents the increase in serum glutamic oxalactic transaminase and glutamic pyruvic transaminase seen in inflammation. Curing Diseases : 1. It is useful in gastric and duodenal ulcers. 2. 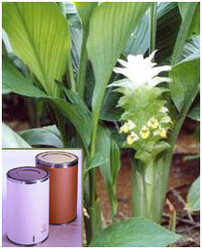 It is used in hepatitis, jaundice, menstrual disorders and menstrual haematometra. 3. It is also used in rheumatism, pains and boils. 4. It is used to cure wounds. Possible Combinations : Curcumine + boswellic acid (anti-inflammatory).